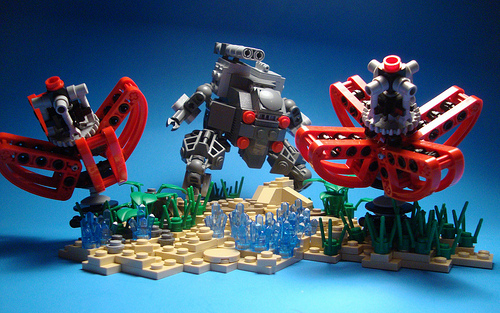 This lovely display by Justin Pyne seems to be attempting to illustrate the concept of exploration, rather than just an exploration mecha. The choice of perspective, putting the fascinating alien (underwater perhaps?) flowers in the foreground, with the character in the background really adds depth to the photo. Speaking of those flowers, they’re quite interesting as well, the use of large scale technic pieces is surprisingly effective.